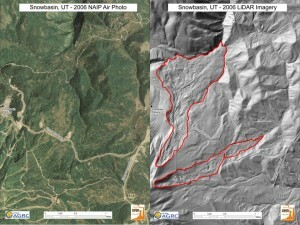 Comparison of 2006 National Agriculture Imagery Program (NAIP) 1-meter color orthophoto imagery (left) and 2006 2-meter airborne LiDAR imagery (right) in the Snowbasin area, Weber County, Utah. Red lines outline the Green Pond and Bear Wallow landslides that are clearly visible in the LiDAR imagery, but barely visible to undetectable in the NAIP imagery. Light detection and ranging (LiDAR) is a technique of transmitting laser pulses and measuring the reflected returns to measure the distance to an object or surface. LiDAR is commonly used to determine ground surface elevations to create highly accurate, bare-earth digital elevation models (DEM). As a LiDAR instrument can send pulses at a rapid rate, a high-point spacing density (e.g. several returns per square meter) is possible; much greater than would be possible by traditional surveying methods. Landslides, fault scarps, and other features that are difficult to detect visually because of vegetation, access, or other issues, may often be clearly shown in LiDAR data. The Utah Geological Survey (UGS) acquires LiDAR data with its partners in support of various geologic mapping and research projects. In 2011, approximately 1902 square miles (4927 km2) of 1 meter LiDAR data was acquired for the Cedar and Parowan Valleys, Great Salt Lake shoreline/wetland areas, Hurricane fault zone, Lowry Water, Ogden Valley, and North Ogden, Utah. In 2013-2014, approximately 1422 square miles (3683 km2) of 0.5 meter LiDAR data was acquired for the entire Wasatch fault zone from north of Malad City, Idaho, south to near Fayette, Utah, West Valley fault zone, and most of Salt Lake and Utah Valleys in Utah. The datasets include raw LAS (industry standard LiDAR format), LAS, DEM, digital surface model (DSM), and metadata (XML metadata, project tile indexes, and area completion reports) files. The 2011 datasets were funded by the UGS, with the exception of the Great Salt Lake area, which was funded by the U.S. Environmental Protection Agency and the UGS, and the North Ogden area, which was funded by the Utah Division of Emergency Management (UDEM), Floodplain Management Program. The 2013-2014 datasets were funded by the U.S. Geological Survey, Salt Lake County and various local cities, UDEM, and the UGS. 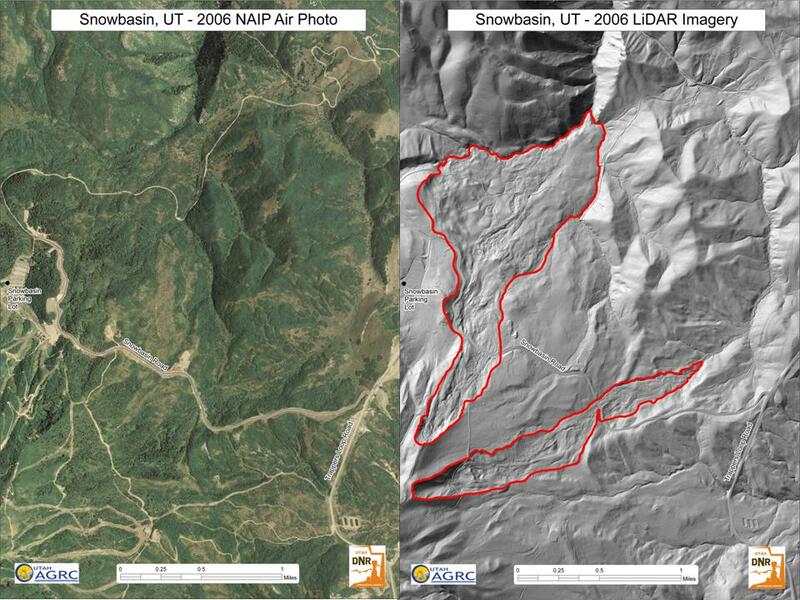 The 2011 acquisition was performed by Utah State University, LASSI Service Center and the 2013-2014 acquisition was performed by Quantum Spatial (formerly Watershed Sciences) through partnerships developed by the UGS and the Utah Automated Geographic Reference Center (AGRC). This LiDAR data is available from the AGRC Raster Data Discovery Application and by FTP (DEM data and metadata only), is included in the U.S. Geological Survey National Elevation Dataset that is part of The National Map (DEM data and metadata only), and OpenTopography (all data and metadata), a National Science Foundation supported portal to high-resolution topography data and tools. LiDAR data is not directly viewable without suitable software, such as Global Mapper, 3DEM, and ESRI ArcGIS. Data from OpenTopography may be processed online to KMZ files using user-selected parameters (such as hillshade altitude and azimuth that may be viewed in Google Earth), and is generally the easiest way to access the data for most users. The datasets acquired by the UGS and its partners are in the public domain and can be freely distributed with proper credit to the UGS and its partners.